Buying things from the fella with the pale fish-like face down the pub never ends well. 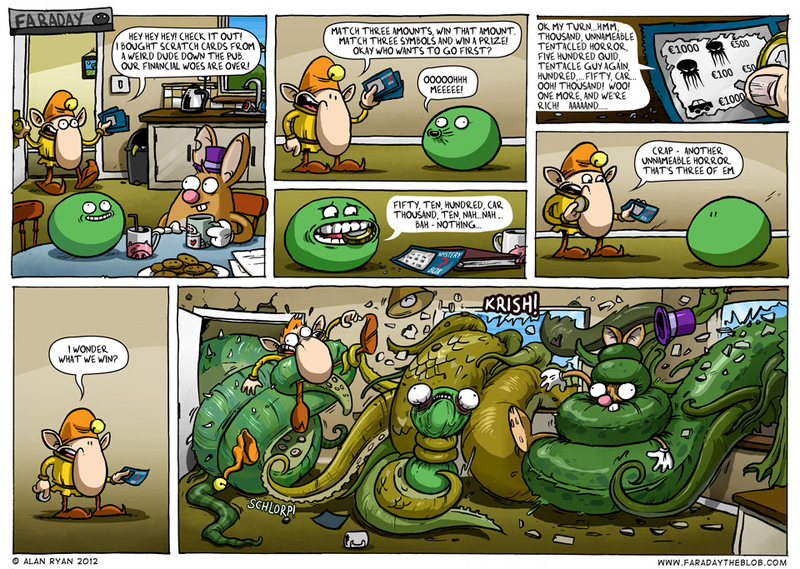 This entry was posted on Friday, March 2nd, 2012 at 11:43 pm and is filed under Comics. You can follow any responses to this entry through the RSS 2.0 feed. You can skip to the end and leave a response. Pinging is currently not allowed. Jeff – Nice! Might have made a better title. Mr. Elf is a… ginger?! Who knew? Mr. Elf’s dazzling barnet has been seen before – I think this was the first time: Mr. Elf’s Bad Day, also here: The Mask. There’s probably more but I can’t remember right now… I thought it would be funny if his hair was the exact same colour and, er, shape as that ridiculous hat he likes to wear.